This is a sponsored post. I was given complimentary materials to use and review, but the opinions in this posts are 100% my own. Even though our entryway is the first thing visitors get of the inside of our home, I haven’t spent too much time making it look nice. I hung a large photo gallery wall on one of the walls, but otherwise it was just a bland space that became a dumping ground for shoes and boots. Not the best first impression we could give our guests. 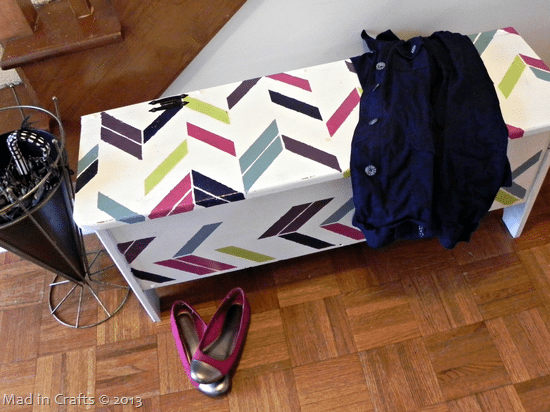 I was able to change all that by infusing some color and pattern into the space and adding much needed storage with a cheap second-hand bench. 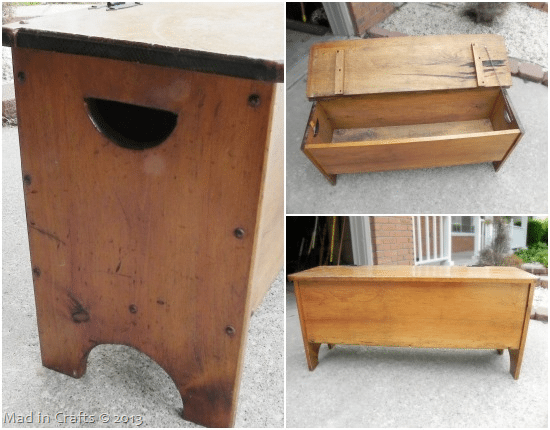 My mom found this second-hand bench for $10, and, although it was dirty, it was still in solid shape. It needed a little oomph before it went in our entryway though. I knew a stencil from Royal Design Studio (affiliate) was just the thing it needed. 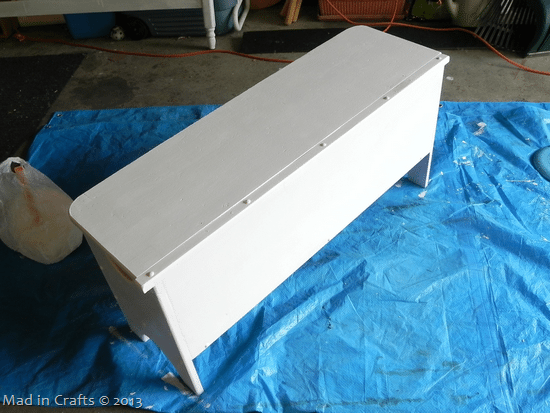 After sanding the bench down, I gave the whole thing two coats of flat white paint. I like to use flat paint underneath a stencil because I think the stencil paint adheres a bit better and dries faster. 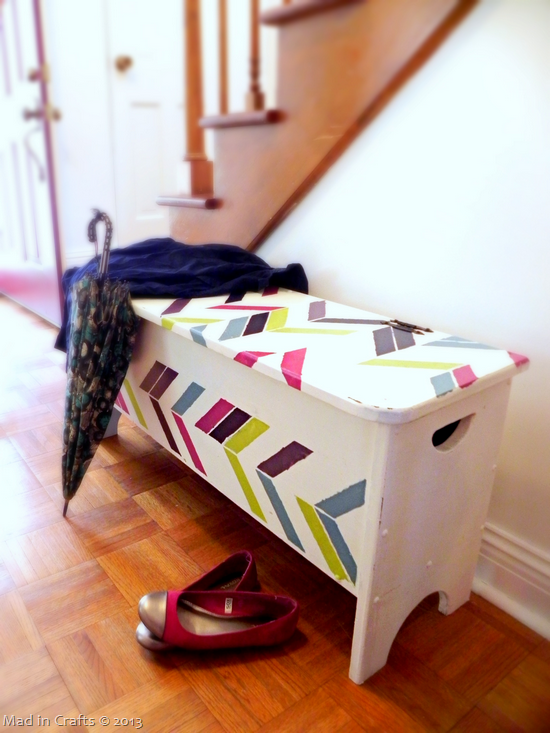 I wanted to liven up our bland entryway, so I used FIVE different paint colors with my Royal Design Studios stencil. I will give you more information on my color palette later in the week. 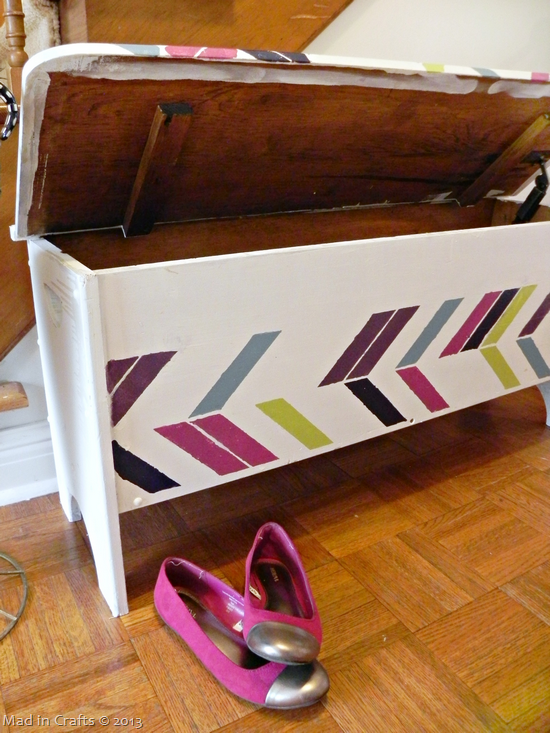 The combination of the paint colors and the energetic Herringbone Shuffle Stencil transformed a boring piece into a statement maker! I even think the herringbone pattern looks good with our parquet floors! I replaced the flimsy chain that kept the bench lid in place with a stay-open hinge. I didn’t want to be constantly worrying about my kids slamming their fingers under the lid. 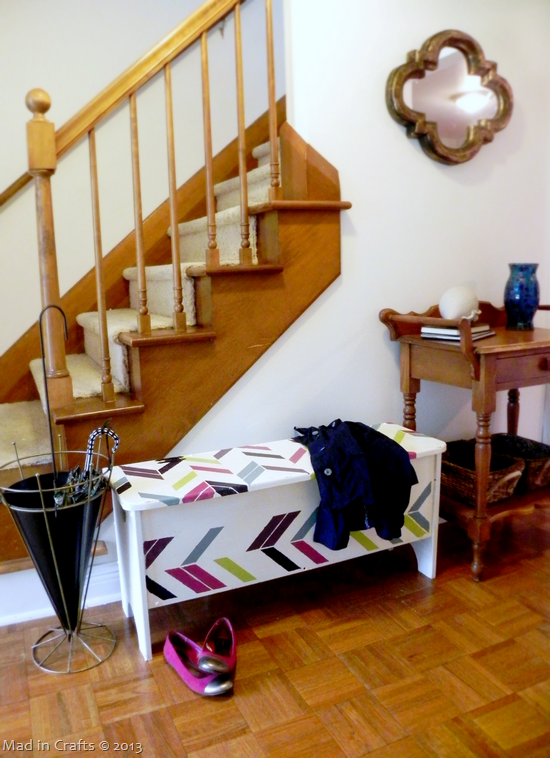 While I appreciate that the bench adds some much needed color and pattern to the entry, the piece is especially great for its storage capability. Our stairs had become a dumping ground for dozens of cast off shoes. It was messy and a bit of a safety hazard. Now we can toss our shoes inside the bench, grab them back out when needed, and sit on the bench to put them back on. 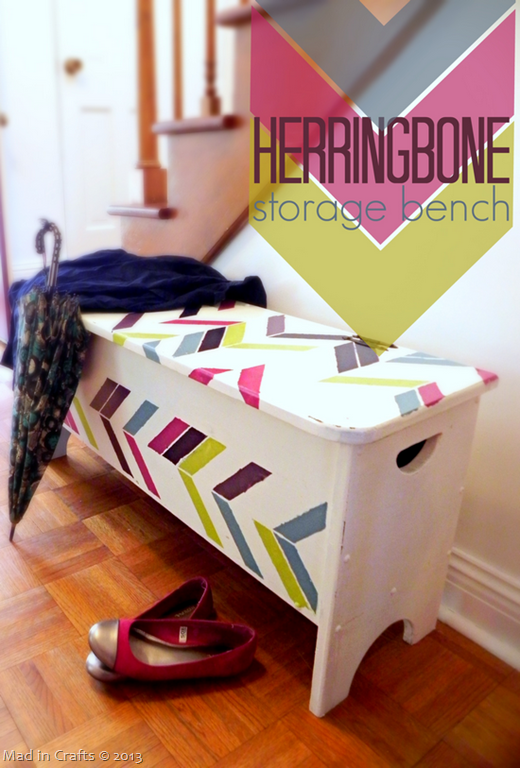 The bench really is a colorful and functional piece of furniture that I am sure will get quite a bit of use. This isn’t the first time I have used a Royal Design Studios stencil. I completely transformed The Mad House dining room with another RDS stencil. If you have a room or a piece of furniture that could use a patterned upgrade, check back tomorrow for a surprise! Can I borrow your mother? Mine has many wonderful qualities but she wouldn’t have given that bench a second look, if she noticed it at all. What a great find & the price can’t be beat. 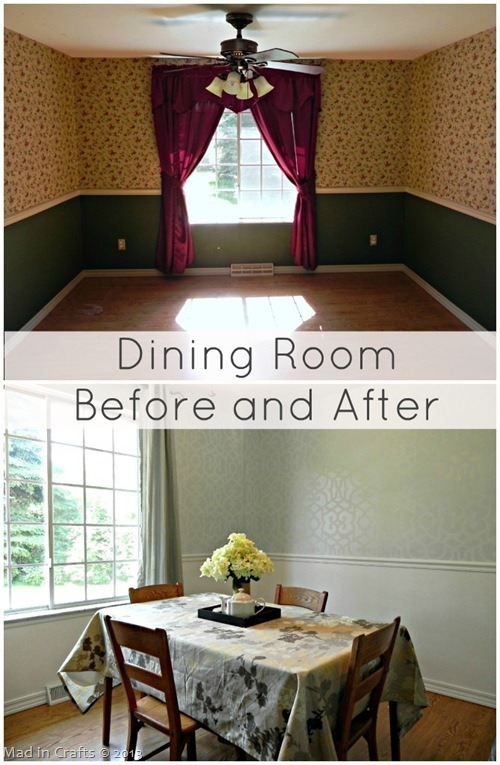 Your dining room was so very dark with those drapes covering that beautiful window & the new wall treatment/color makes it so much more inviting. I’ve always thought I’d like to redo a house in need of a make over but the truth is, I’ve got too many back problems & arthritis to be able to do that kind of work but I can do make overs on smaller pieces of furniture. Great post, thanks for sharing it.